One, cool idea, looks nice and fun to make. 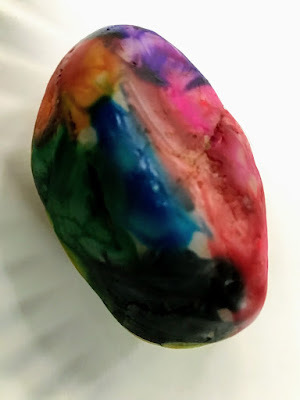 Two, it reminded me of the Pet Rocks in the 1970s that made millions (this one was hippie even though those back then weren't actually even colored). A business guy came up with the idea to sell smooth rocks from Mexico beach and market them as pets. Yeah, they are so lovable and easy to care for! It was one of the great branding and marketing events of the 20th century. Who would think people would actually spend money on a plain dumb rock that you could basically pick up off the street? But incredibly, putting the rock in a box with holes (so the rock could breath) and sitting it on a little stack of hay with an joke of instruction book for caring for your rock, SOLD. And in fact, over 1,500,000 rocks were sold at a pop of $4 each. The guy became a millionaire and got rid of a truckload of worthless rocks. Yes, "One man's garbage is another man's treasure!" But surely this was getting a little ridiculous.